In the midst of turmoil surrounding his football team, Michael Vick had to deal with a family matter first. Vick’s brother, Marcus, caused quite a stir among Eagles fans during Monday night’s 28-13 loss to the New Orleans Saints. 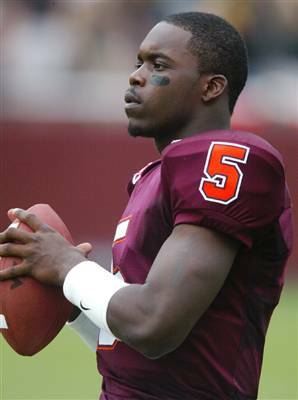 Marcus Vick tweeted: “Please trade my brother. We requesting out of Philly!!!! Please please please……” It didn’t stop there. Vick went on a rant bashing the offensive line and the defense for the Eagles struggles. The tweets did not sit well with Eagles fans and, after the loss, Michael Vick was asked about his brother’s tweets. Vick was unaware of his tweets but promised to address it with his brother. It looks like this situation has been resolved. Vick’s tweets certainly irritated an already angry fan base but, with the exception of the trade tweet, some of his offensive line remarks were pretty accurate. Nonetheless, Eagles fans do not need a family member of a player requesting out of the terrible situation that the fans have to endure.